The Long Tall Texans: ‘Headless’. There are some jobs you simply have to do. 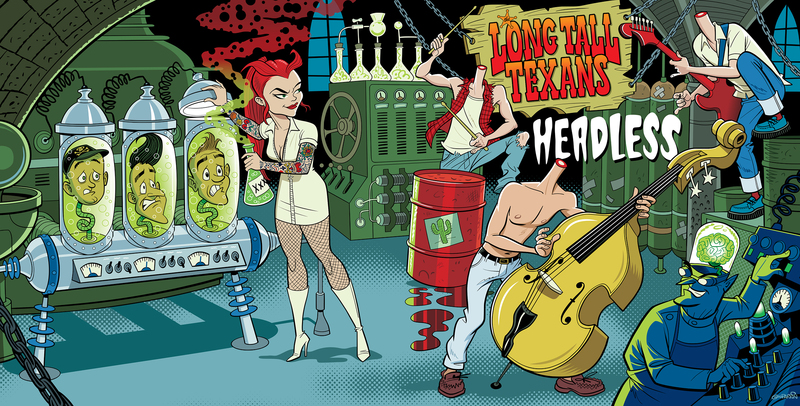 I was contacted recently by Mark Carew, the perma-grinning slap-bass player from local rockabilly legends, The Long Tall Texans, about creating a cover for their forthcoming 10″ vinyl release, ‘Headless’. It was great to learn that they’re still going strong, and I was more than happy to get involved. I did a number of record covers and t-shirt designs for the band back in the early-90s, so it was great to revive the old partnership. There’s more about my work with the ‘Texans on one of my earlier Drawstring blog posts, if you’re interested. Here’s a sneak preview of the artwork. The record, which will be on coloured vinyl, will be released in May, and is available for pre-order from Western Star Records. Love it => Design + Psychobilly!!! !